Arrival of penguins in the Byculla Zoo has created a controversy off late. Concerns regarding their safety and survival often took the headlines. Recently, 1 out of the 8 penguins imported from South Korea died in the zoo. Since then, the media has been blasting the authorities with suspicions. While you might sight penguins living happily in artificially created environment around the world, here a few places to rejoice them in their natural habitat. All you have to do is buy a flight ticket and fly your way to these fascinating destinations. The cute little 12-inches-short species of fairy penguins have been for centuries ruling the island. Tourists flock the island to watch the intriguing penguin parade. If you have a keen interest, you may also join a guided tour where you'll get a chance to walk among the penguins. If you have more days in hand, you can take some time to witness its other wildlife like koalas, wallabies, elusive anteaters, seals and whales. This is the only time we can legitimately use the word ‘jackass’. African penguin or the 'jackass penguin', endemic to this region is a part of the popular tourist circuit. Found on the Boulders Beach, about 39 km from Cape Town, it is one of the more commercialised places in South Africa. There are broadwalk viewing areas that give you excellent photography opportunities. If serendipity is your thing, you may even encounter a penguin while you’re swimming or diving. An island formed out of the anger of a volcanic eruption, more so beautiful than ever, is a place of wildlife miracle. Along with penguins, you can also spot seals and sea lions. Albeit watching penguins is ‘the’ thing here, locals emphasize on environmental education and sustainable ecotourism. 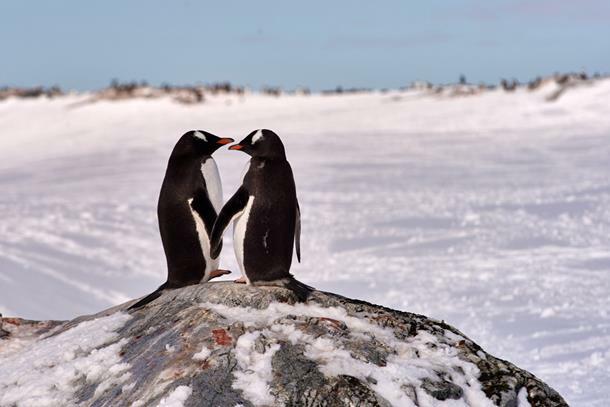 Penguin conservation and habitat restoration are of prime importance. You can even experience a sunrise tour of yellow-eyed penguin colony and watch the birds in entire glory. Sprawling over the countries of Argentina and Chile, Tierra del Fuego hosts a variety of penguins. Depending on where you are travelling, you are sure to find an island with these black and white dainty little birds. Bahia Inutil in the Chilean part of Tierra del Fuego has more than 100 penguins. It is the only colony outside sub-Antartic islands with king penguins. There are several places in Tierra sel Fuego that let you literally have walks with the penguins. Galapagos is not overtly famous for penguin watching, and that’s where the fun lies. From all the places that we have listed here, Galapagos Islands are the least crowded for penguin watching. There are boat tours that take you near the island, from where you’ll observe the species. Here’s a tip - if you take a boat tour along with snorkelling, you might have a Happy Feet as your swimming partner. The sad reality is that climate change and mindless tourism have largely affected the population of penguins, and if conservation and restoration is not addressed, then it won’t be long that the penguins go extinct. Because the species is endangered, practices like penguin fostering in artificial environment, raise a trench of suspicion.